Mumbai is home to roughly fifteen million people, and accounts for almost one third of India 's GNP. Yet its heartbeat isn't to be found in the air-conditioned offices of multinational firms. Rather it throbs, with a raw, pounding beat, on the sidewalks of the city where one-man entrepreneurs sell everything from food and clothes to second-hand books and electronic gadgets. Many of these small businessmen have migrated to the city from villages as far away as poverty-stricken Bihar , arriving in Mumbai with not much more than steely determination and a small bundle of belongings. It is their hard-scrabble lives which fuel the city's roaring street economy. They are the "wallahs" of Mumbai. "Wallah" translated literally means "man" and a prefix, such as " dhob i" (washerman) , indicates an occupation. 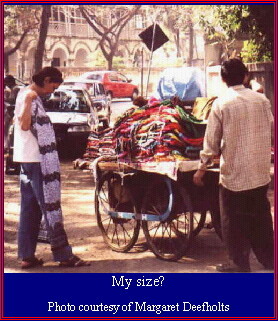 Although many of these street vendors live on the edge of subsistence, few have any complaints. Take Shiva Raman. 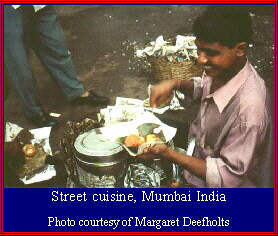 He is squatting on the sidewalk outside Churchgate Station in front of a kerosene-fueled stove. On it rests a pot, bubbling with a spicy mixture of diced potatoes and gravy. In another container is a stack of oval rice cakes. For rush hour commuters flooding out of the station, Raman's stall provides a quick, cheap breakfast snack on their way to work. Raman is sold out by eleven o'clock and after taking his overheads into account, makes Rs.250 for a half-day's work. Can. $9 may not seem much. But Raman shrugs: "Yes, I live in a slum shack, but I have whatever I need - a table fan, running water, (siphoned illegally off a water main, as is his electric supply) a charpoy (reed mat) to sleep on, dal and roti to eat, my two shirts, a pant--even a pair of chappals (sandals)" He adds. "My friend has a TV and we watch " Kaun Banega Crorepati " (a popular Indian version of "Who Wants to be a Millionaire") and I think what mosebath (hardship) all those rich people must be suffering, always worrying about their big-big investments and afraid of thieves taking their jewellery. Too much garh-barh ! (trouble). Me? I have nothing and everything. I go home, chat in the evenings with my neighbours, sometimes go to the movies, and send money to my wife in the village. No problems!" 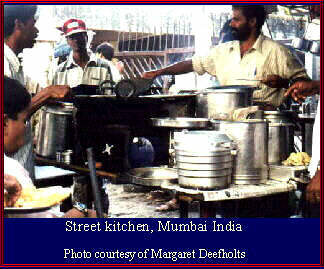 Perhaps the most widely known--and unique--of all Mumbai's "wallahs" are the city's 5,000 dabba wallahs . A "dabba" is a 'tiffin carrier' or 'lunch box'. The dabba wallahs, deliver home cooked meals, picked up each morning from suburban households, to 170,000 office workers spread across the entire city and its environs. The system relies on multiple relays of dabba-wallahs, and a single tiffin box may change hands up to three times during its journey from home to office. Few dabba wallahs can read or write--they interpret a series of colour coded dots, dashes and crosses on the lids of the lunch containers, which pin point the area, street, building and floor of the dabba's final destination. Illiterate as they may be, their margin of error has been calculated at an amazing one mistake in eight million deliveries. 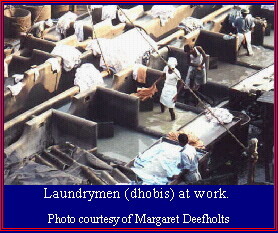 Less well known, yet equally astonishing, are the city's dhobi-wallahs (laundry-men). They too are illiterate, and from a bridge parapet overlooking the outdoor dhobi-ghat (washing station) the scene below me seethes with thousands of bare-chested men, standing ankle-deep in water and soap suds, scrubbing and thrashing garments on stone slabs, and rinsing them out in square stone tanks. Along the perimeter, gaily coloured streamers of clothes are hung up to dry. Later, they will be starched and ironed, a small cloth tag with identifying black dots and dashes sewn into the edge of each garment, and the dhobis will hand deliver bundles of garments to homes and hotels across the city. 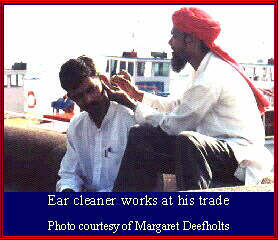 At the Gateway of India, overlooking the harbour, I watch a man wearing the red turban of a kaan-saaf-wallah, probing a sliver of bamboo tipped with a wad of glycerine-soaked cotton-wool into a customer's ear. Job completed, the kaan-saaf-wallah receives his fee of Rs.10--about 35 cents. It was a straightforward matter of cleaning out ear-wax, he tells me, but if his client had an infection, he would have had to use mercurochrome or other ointments for which he would charge Rs.20. How many customers does he have in a day? "Maybe about fifteen or twenty," he says. A different kind of medicine man operates out of a makeshift tent on the sidewalk of a traffic-choked bridge. Ramlal, a hakim practices alternative healing, and his arsenal of cloudy glass bottles, rusty tins and small packets contain powdered pearls, extract of crushed belladonna and wild indigo. An assortment of gnarled roots, dry leaves and seeds are spread out on a mat in front of him. Sitting by his side, is Ramlal's eight year old son. "My father and grandfather taught me how to cure diseases," he says. "Now my son is learning from me." I ask Ramlal what he would prescribe for my dust-induced sore throat. He feels a pulse at the base of my neck, examines the soles of my feet, and asks whether I get angry easily and if I am afraid of crowds? At no point does he look down my throat. He offers to compound a mixture for me which will cost Rs.25--just under a dollar. Further along the sidewalk from Ramlal is a nai , or street barber. He is busy slathering a client's face with soap and then goes to work with a vicious looking cut-throat razor. His co-worker not only trims his customer's locks but also snips away offending nostril hair. A little further along, a cobbler does a quick repair job on a loose buckle on my sandals--while an itinerant chavi-wallah , carrying an assortment of jingling locks and keys strung from a pole across his shoulders, stops to watch the proceedings. I wander into a narrow residential lane, where the morning is unfolding in typical Mumbai fashion. Under porch awnings of apartment blocks lining the road, a rui-wallah strums a one-stringed harp-like instrument as he fluffs out the cotton of old mattresses and pillows; a taki-wallah re-pits with a hammer and chisel, the surface of a stone grindstone which housewives use to pound their curry spices and a chhuri-wallah pedals his portable knife sharpening machine. The scream of steel on steel is all but drowned out by the bedlam of traffic surging past the sidewalks where--undaunted by the melee of cars, scooters, cyclists, jay-walkers and stray cows--two labourers ( haath-gadi wallahs ,) their brows glistening with sweat, push a wheeled hand-cart stacked with heavy household furniture. They inch past a baraf-wallah, carrying blocks of burlap-covered ice on a creaky bullock cart. Along the sidewalk, a group of fisherwomen carrying baskets on their heads shriek "muchhi-wali, muchhi" and a man selling home-baked cookies yodels, "biscoot-wallah, aayyy, biscoooot!" Not all of Mumbai's street entrepreneurs are illiterate. As I walk out of the lane and round a corner, the sidewalk is lined with kiosks, each furnished with a desk and chair. The noise of traffic is punctuated with the stutter of typewriters, some of them ageing Remington-Rand manual machines. 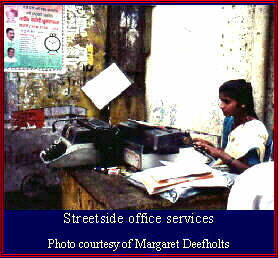 Manju, attired in a business-like cotton sari, feeds a sheet of court stamp paper into her IBM Selectric and clacks her way through a legal writ petition. Her next assignment is stacked near her chair: hand-written columns of numbers to be converted into typed spreadsheets. At Rs.5 per page she takes home about the equivalent of Can $160 a month. Flora Fountain, in the heart of the city, is surrounded by dignified Victorian-era stone buildings which would not look out of place on London 's Regent Street . Along the passageway fronting one of these establishments, a group of tourists are clustered around an "antique" gramophone, complete with shiny brass horn, and a metal claw fitted with a steel needle. The vendor cranks up the machine, sets a 78 rpm record on the turntable and a tinny-voiced Bing Crosby informs the audience that he is dreaming of a white Christmas. How much? Only Rs.2,500 ($90). Special price! While I have no problem resisting this offer, ten minutes later, I ante up $1.20 in return for the services of Harshad Shastri, astrologer and palmist. Shastri is an elderly man, wearing a crisp cotton bush shirt and knife-edge pressed trousers. He asks my date of birth, studies both palms and zeros in with surprising accuracy on three "significant years" in my past. He also assures me that I will not shuffle off this mortal coil until I'm in my mid-eighties. I ask him how long he has been practising his 'science'. He points to the flagstones on which he is standing. "Madam, I have been here at this very spot every afternoon, for more than forty years. Accepting pre-destined fate is one thing, improving one's karma is another. Laxmibai, a woman in a rumpled sari, sits outside a temple entrance with a cow tethered to one side. 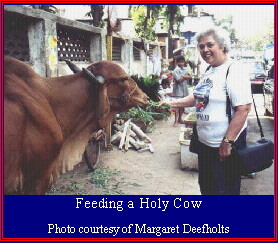 For a Rs.5 "donation", a handful of fodder is handed over to customers who feed the "holy" cow thereby earning blessings both in this life and the next. Business is brisk with devotees entering and leaving the temple. The cow wears a decidedly replete expression, and languidly refuses my proffered fistful of grass. Laxmibai usually runs out of feed by noon, at which time accompanied by her burping bovine asset, she walks five miles back to her hut bordering a marshland thicket. Her husband, a doodh-wallah hawks the cow's milk (likely as not diluted with marsh water) door to door each morning, and they use the cow's dung as cooking fuel. The weed-feed grows rampant at the edge of the marsh, and for no outlay except travel time, the family (and the cow) live quite comfortably, thank you. Mumbai's street activity runs the gamut from the whimsical to the horrific, and I am catapulted from one to the other without warning. Barely a hundred yards away from Laxmibai's cow, I find myself watching a family of ragged street acrobats. The father ties his baby son to an eight-foot bamboo pole and while his wife beats a small drum, he walks a rope strung between two portable wooden struts, with the pole balancing on his head. The child dangles fifteen feet in the air, above a concrete pavement. The onlookers clap, and coins are tossed into a bowl. The crowd disperses and the woman discreetly breast-feeds the baby while her husband counts the take. He says something to his wife, and she laughs, smacks his shoulder and says, " aarey, hut ja " (get on with you!). He lights a beedi (Indian cigarette) and hunkers down on his haunches, his face expressionless as he stares into the middle distance. The baby wails as the mother draws him away from her breast and lays him on her lap. The father gently strokes the child's head. In another ten minutes or so, he will once again risk his son's life for a handful of coins. A balancing act between life and death. Commonplace on the sidewalks of an unrelenting city. The wallahs of Mumbai have a word for it: 'survival'. Reports of an impending war between India and Pakistan over the issue of terrorists and Kashmir appear intimidating, but much of it is part of an on-going sabre-rattling exercise between the two countries which surfaces from time to time. Despite the terrorist attacks in Bombay back in 2011, most seasoned travelers through the Indian sub-continent, and visitors to large cities like Mumbai, will find that normal day-to-day activities continue without threat of disruption to tourist traffic.